You know those conversations when you're talking to someone and they light up with the enthusiasm of their subject? What they're saying is obviously important too, but at times like this it's the way their face lights up, how animated their movement becomes and the general sense of excitement they give off that really captures your attention. As though every fibre of their being is smiling and you can't help but enjoy the experience and smile too. Such was the enthusiasm of the bookseller when I asked for his help to select a book. I'd already explored the new and secondhand fiction and found more than enough to capture my interest, but as I was in Slightly Foxed - the bookshop connected to the publisher of the same name - it seemed only right my purchase be one of their own books and so I'd asked for help. I can't remember the words the bookseller used when helping me to whittle down my choices, but the friendly enthusiasm and clear enjoyment he'd had in reading the books were highly infectious as he answered my questions. 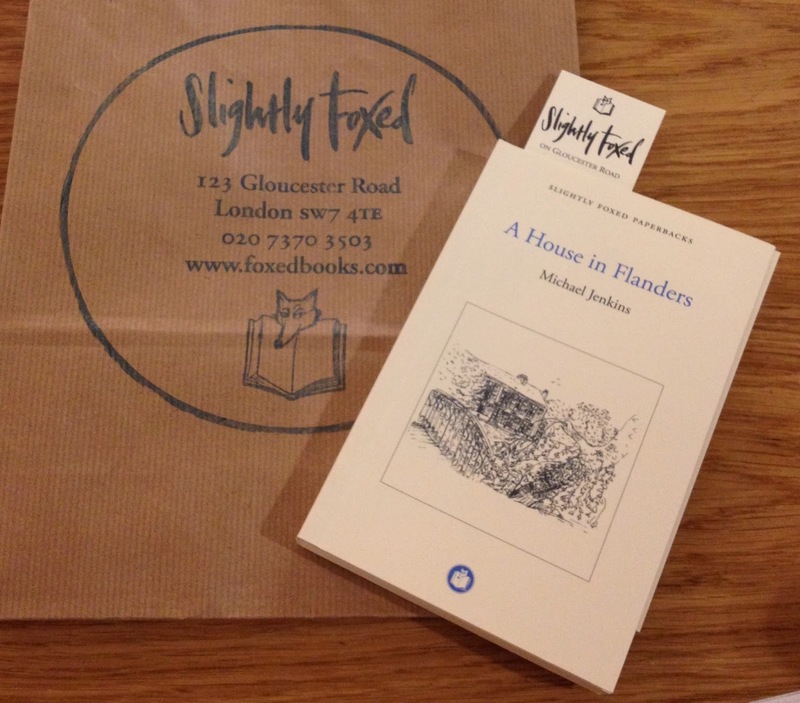 Selecting A House in Flanders by Michael Jenkins, I now look forward to finding the same pleasure in reading as I did in hearing about the book during my visit. I'm sorry for the brevity of this entry - I loved the bookshop: the wall of new fiction as you walk in, opposite a wall of secondhand books, with more fascinating collections and subjects downstairs; the extras; the friendliness of all the staff; and how light and spacious the small, cosy area felt - but the truth is, the highlight of this visit was talking to the bookseller. Since my visit I've read both parts of their website, for the bookshop and the publisher, and been fascinated by all the wonderfully bookish things they do to celebrate and reintroduce us to 'lost' reads. And I've agonised over how to do it justice here (it's simpler if you just check out the shop and site for yourselves). But most of all I've been aware that - as much as I love my bookshop visits - I'm not sure I've ever been able to achieve the same levels of infectious and welcome enthusiasm for my subject as I encountered on that day. A weekend away with a friend was supposed to take in a variety of cultural activities, some beautiful countryside and a couple of good places to eat. The views and the food were pretty much a given, but what my friend didn't consider while we drove towards the south coast was the power of my bookshop homing beacon. A chance decision to go on a detour to Arundel Castle on the Sunday afternoon was where it all went wrong (or right), with our lack of preparation revealing the castle to be closed and instead leaving us exploring the town. Where we found two bookshops on one road. My friend was remarkably composed as I skipped away to explore the first one, leaving them in the street looking at... well... something that wasn't a bookshop. I'm sure it was interesting too, but I had The Book Ferret in my sights. With large, welcoming windows and a colourful display, this bookshop called to me more than any historic castle, and while it may not have had the turrets and dungeons to get lost in I certainly found plenty to explore, without the need for an entry fee. From the spacious front room, to the colourful children's area - complete with friendly Moomin - there were a wide variety of period and modern features and all the charm you'd expect in any historic property, not forgetting the wide selection of books to keep me entertained. Which was possibly a little unfair on my friend, who eventually found me nose-deep in the fiction. Picking up We, the drowned by Carsten Jensen I resisted the urge to read in the shop (not for too long, anyway) and took one last look around. Fully intending to leave and resume our tour of the nearby historic attractions I went to pay, which is when I threw all consideration for my friend out the window (sorry) as I realised the woman behind the till was reading a Tove Jansson. We soon launched into a mutual appreciation of her writing as the bookseller became my tour guide through the works of this wonderful author. The quiet of a Sunday afternoon was ideal for this visit to The Book Ferret, which perfectly balanced open space with good quality books and friendly staff, but if it's a crowd you're after perhaps a walk down the street would be more to your liking. Crammed with something like 30,000 secondhand books, Kim's Bookshop was a complete contrast to the calm, open space I'd left behind. I forget how many stairs I climbed and floors I wandered as I took in the enormity of the Tardis-like shop. With crowds of books to hunt through this was a maze to get lost in, and it was with some surprise that - clutching a copy of David Mitchell's Cloud Atlas - I eventually stumbled across my friend in the history section. Also a reader, they'd come to appreciate the different cultural angle our tour had taken by buying a book, albeit a more intellectual choice than mine. Yes, it's a bit of a shame we missed out on the castle, but thanks to two bookshops we were still able to enjoy a couple of hours of discovery - and I'm more likely to read these two purchases than any guide book. Walking along Marchmont Street in Bloomsbury one rainy Saturday morning I spotted a bookshop I'd not heard of before. Ordinarily in such a situation I would rush through the door and excitedly survey my find. On this day I'm ashamed to admit I dithered. I stood outside the bookshop and thought: "Will it have anything for me?" Fortunately, this thought lasted no longer than a minute, I stepped through the door of Gay's The Word. The first thing I noticed upon entering the shop was a wall of fiction, colourful and inviting and sprinkled with names and titles I recognised and/or owned. What better reward for stepping into the unknown than the reassurance of a little familiarity? Ashamed of my previous ignorant dithering, I decided the sensible thing would be to ask about the books on display. The friendly bookseller explained this was the gay fiction, elsewhere were sections for lesbian and transgender readers, with non-fiction all together. As we stood and chatted - comparing favourite reads and me making the most of the opportunity for recommendations - I learnt just how broad the genre of gay fiction is. Scanning the shelves there were many books that - whether from ignorance, naivety or a focus elsewhere - I'd missed the interpretation of a scene or relationship. Then there were those included simply because the author's other works were stocked, not forgetting the many excellent gay authors to be read - there was no shortage of variety. Wandering around the rest of the bookshop there was all manner of gay subject matter in a wide and varied non-fiction section. Ranging from politics and history to how to come out to your parents, there were a lot of topics covered for the serious reader. Looking for something more easily accessible I naturally gravitated towards the fiction, discovering the lesbian shelves to be just as varied and fascinating as the men's. In fact, so appealing were all the books, and so excellent the recommendations, that I again found myself breaking my one book rule and buying two: Patrick Gale's A perfectly good man, and Fannie Flagg's Fried green tomatoes at the Whistle Stop Cafe - who hasn't watched and loved the film? As the UK's first (and, sadly, last) lesbian and gay bookshop, Gay's The Word's website explains: "We are proudly independent and very much see ourselves as the friendly and non-judgemental safe space of the gay scene. We are a straight-friendly, gay-family business." Which was very much confirmed during my visit. I lost track of how long I happily chatted with the bookseller, who was obviously very good at both the book and human side of his job, and I thoroughly enjoyed my time in the bookshop. Given this warm and typically bookshop-ish welcome, and considering the controversy surrounding Russia's anti-gay laws and the attention the Sochi Winter Olympics are getting for the wrong reasons - and how strongly I feel about this - I'm ashamed to admit to my earlier moment of doubt. But it's only right that I'm honest, because as vocal as I can be about equal rights I'm guessing I'm not the only one who would pause on that doorstep. 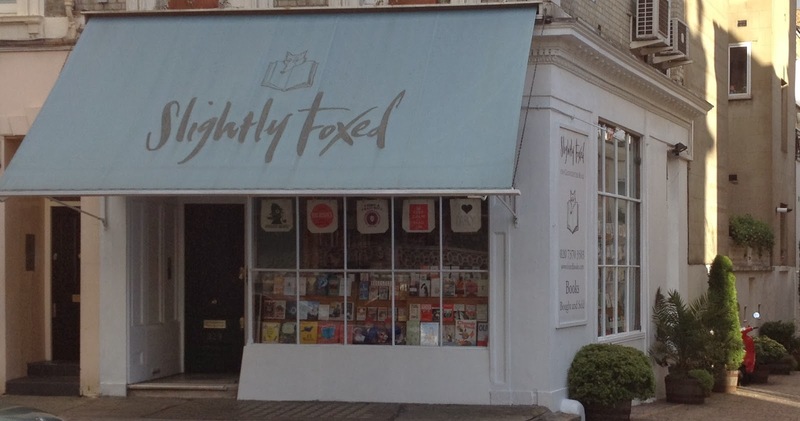 Hopefully this post will help others who may also dither to remember that specialist doesn't mean exclusivity: here is a bookshop, with a window full of fiction and a friendly bookseller by the till - what could be more welcoming? Usually, I visit a bookshop, buy a book and write a blog, but this week's post takes a break from tradition. 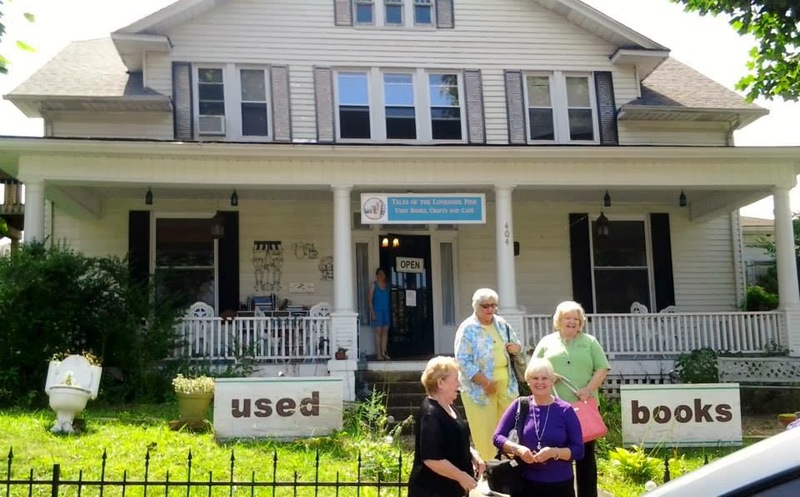 Because this week's entry is about a bookshop - or in this case bookstore - I wish to visit: Tales of the Lonesome Pine in Virginia, USA, and what I like to think of as its biography, The Little Bookstore of Big Stone Gap. But why did I choose this particular American secondhand bookstore? It's hardly the most famous store of its kind across the Atlantic. The story begins several months ago when I was first contemplating all the different bookshops I'd like to meet. I 'met' Wendy Welch in the same way I encountered all the other bookshops that inspired this blog, during a very fun but daft game on Twitter (for a vague explanation see here), as she was one of the names I'd encounter semi-regularly. Initially remembering her for being a fun personality, I soon realised she runs a bookstore, had written a book, and shares her home with a Scottish husband, a dog or two and a gazillion (slight exaggeration) foster cats in search of forever homes. I was naturally fascinated and wanted to know more, so in the absence of a free plane ticket I read the book (as a stop-gap, I'm determined to visit in person one day). The best way I can explain the book is that if I was planning on setting up a bookshop of my own I'd consider The Little Bookstore of Big Stone Gap to be my ultimate how to guide. Telling the story of how Wendy and husband Jack turned their dream of owning a bookstore into reality, chapters take readers through the highs and lows (mostly highs) of their adventures in bookshopping land. From bold, free marketing campaigns, to all manner of community events, even revealing the secrets of how the couple first filled their shelves, the book was a real eye-opener to the work, dedication, love and enthusiasm that goes into setting up a successful independent bookshop. Throw in a variety of wonderful anecdotes of (sometimes crazy) customers, the furry members of staff and a foray into some recommended reads, and it was impossible not to get carried away in the story. There were many moments where I'd forget myself and laugh out loud in inappropriate settings, and the book had more than its fair share of corners turned down as I picked out thoughts and anecdotes to be shared with others or simply return to when the mood takes me. 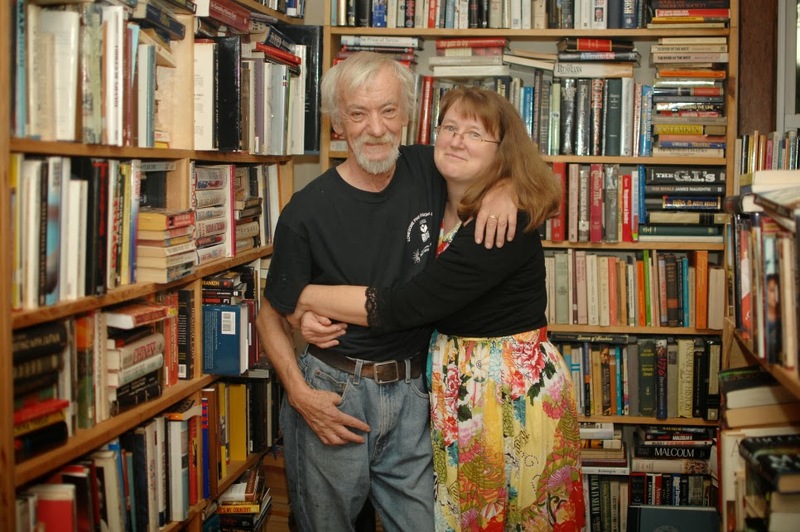 But most of all the book was an introduction to a bookstore that's very much a part of its community, both as a place to discover different worlds within the pages of the books, and also as a place to unite with new friends among the shelves of the store. I may not have visited yet, but I consider this post a statement of intent, because as soon as my piggy bank will allow I do intend to hop on a plane to visit and experience the people and cats and shelves for myself. In the meantime, whether in the United States or United Kingdom, we're all united in our love of a good bookshop, and Tales of the Lonesome Pine is definitely one of those. Wendy also has a blog, which you can read here.